It was one of the most heartbreaking moments in the history of Irish rugby but ex-Ireland star Luke Fitzgerald says the dramatic last minute loss to the All Blacks in 2013 was a huge building block for future success. Ireland looked to be about to record their first ever win over New Zealand before Ryan Crotty crossed for a try in the corner with the clock in the red at the Aviva Stadium, turning an historic 22-17 win into a sickening 24-22 defeat. Infamously, Ireland conceded a penalty in the opposition half with just 30 seconds left, with New Zealand producing some scintillating rugby to manufacture a last gasp winner. The narrow defeat was just Joe Schmidt's third game in charge of Ireland, with the strong performance serving as springboard to win the Six Nations the following spring. Ireland added another Six Nations title in 2015 before claiming a third ever Grand Slam last March, and Fitzgerald thinks the lessons learned by Schmidt following that All Blacks defeat have served the team well. Speaking on The Left Wing, Independent.ie's rugby podcast, Fitzgerald explained how Schmidt made changes to how Ireland trained on the back of the last few minutes in 2013. 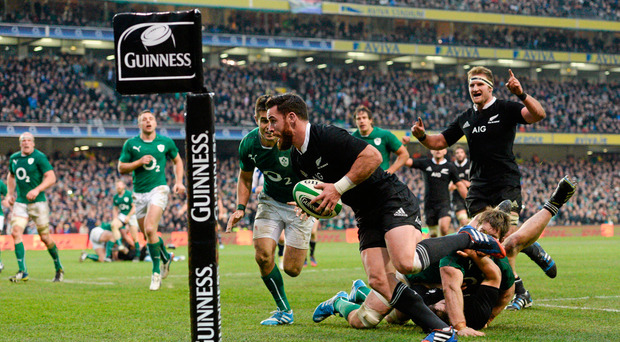 "That game was a real turning point, even in how Ireland trained," Fitzgerald says. "Joe made a few slight changes off the back of that one. The length of the last play was really long. We used to have this unbelievable drill and it goes on for what he felt was the longest passage of play that you would come up against. We would do that passage really, really hard and do three or four sets of it at the end of training. "It was about four minutes and that [last play] was five minutes. He was like, 'we need to be able to cope with five minutes' and he changed the training drills off the back of that. It was really interesting."